If you ever find yourself looking for an eco-friendly way of commuting to the local park, grocery store, or church in your community, you should consider investing in an adult three-wheel bicycle. See, it’s not just for aesthetic purposes. Having the best three wheel bicycles for adults will allow you to exercise on a regular basis. Going to the supermarket should not be tiring at all when you have our bike. Aside from that, it saves you the travel cost from riding public transportation like you used to. Let’s start our list with this budget-friendly adult bicycle from Meridian. 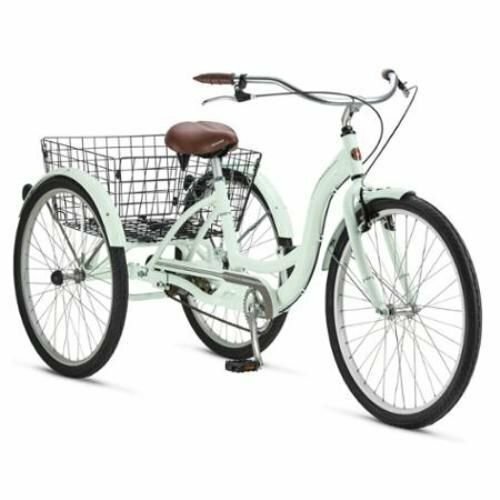 This adult bicycle features a 26-inch frame and has an integrated basket that can hold your things when shopping or going to the beach. Aside from that, its padded spring cruiser saddle will minimize the effect of bumps, making it more comfortable to ride. Its rear folding basket will safely store your belongings as well. You can choose among the variety of colors it has to offer: red cherry, silver, mind, and blue. Now you can ride in style with this adult bicycle. 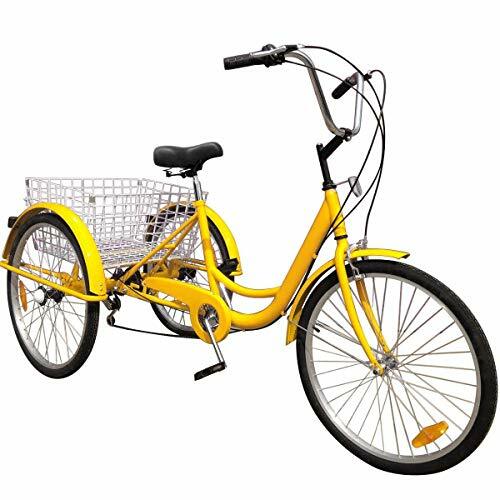 For a stable and balanced ride of your three-wheeler bicycle, it has a wide upright handlebar. Get ready to catch the attention of many with this stylish three-wheel adult bicycle! 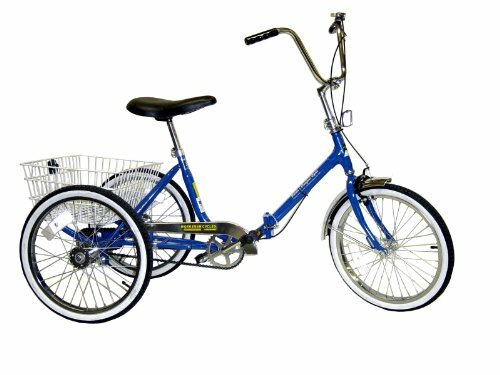 This Worksman Port-o-Trike single speed adult tricycle is ideal for adults who want to enjoy morning exercises using their bike. It offers optimal stability, user-friendly, and comfortable to ride. This bike is recognized as the most compact adult tricycle available in the market. You can fold it for convenient storage, allowing you to carry the bike when camping. When folded, it can fist the standard trunk-mounted car racks or even in minivans. It has a set of 20-inch wheels and low center of gravity, giving you the confidence when driving. The maximum weight capacity of this bike is up to 215 pounds. Designed for convenience and portability, this adult three-wheeled tricycle by Kent offers a sturdy frame and step-through design. It features a suspension fork cushions the ride if the road is bumpy and has potholes. For your comfortability, it has an extra-wide seat and adjustable upright handlebars. 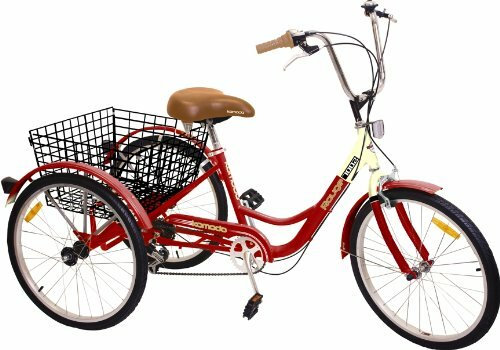 This is a great adult bicycle for beginners with handy cargo baskets mounted behind rider for carrying your things. The linear pull brakes are designed for your safety with 20-inch wheels and a folding frame for easy storage. If you are in a budget, take a look at the Happybuy adult tricycle series three-wheel bike adult. It features an ultra-large capacity foldable basket that can carry your things when shopping or camping. Aside from that, its sturdy frame is made of quality iron that can accommodate biker weighing up to 300 pounds. The 24-inch wheel is perfect for anyone who’s still learning how to bike. Furthermore, it has an easy-riding alloy rim with stainless-steel spokes and smooth-riding tires. No more bounces from bumpy roads! The upright handlebars and extra-comfortable cruiser saddle make it more comfortable to ride long distances. What we like the most about this bike is that it has a variable speed that is easy to adjust gears while you are diving. You can assemble it in less than an hour with little mechanical knowledge needed. 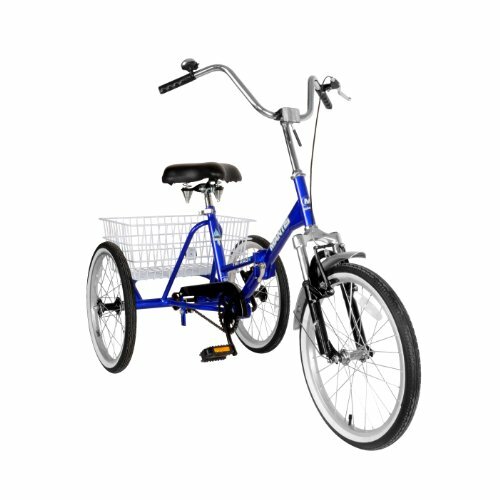 The Mantis tri-rad folding adult tricycle features a folding steel frame with a steel suspension fork. Anyone from 12 years old and above can enjoy this three-wheel bicycle. The wheels and tires are made of the aluminum rim with 20 x 1.75-inch white wall Kenda tires. This drivetrain features a single speed and one-piece crank. The front alloy linear pull brake with parking brake ensures your safety when driving. It also features a front V-brake with the parking brake and easy to adjust steel stem. The large and comfortable saddle will let you use the bike in long-distance travels. Included in the packages are the front fender, rear basket, bell, parking brake, and chain guard. Check out the Komodo three-wheel adult bicycle. It has a set of 24-inch tires with six-speed Shimano RS45 shifter and Shimano RS45 TY-21 derailleur. The bike features a steel handlebar and stem steering system. Moreover, it has a large and soft saddle for comfortable traveling using your bike. Its steel frame can accommodate riders weighing up to 240 pounds. There are alloy front brakes, steel rear brakes for your safety. 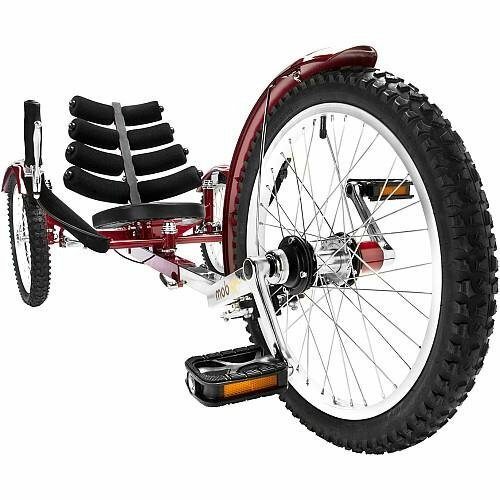 The bike features an ultra-low 15-3/8-inch step-through design and with steel crank and chain and Chinese wheel chain. This is rather a unique three-wheeled bicycle from Mobo Cruiser. It is designed for cruising and exercise on paved surfaces. Now you don’t need to worry about balancing yourself when biking. Albeit it is intended for kids, adults can also use this bike too, thanks to its generous size. It features a low-to-the-ground three-wheel bike frame for superior stability when riding. The dual-joystick steering will allow you to maneuver the bike smoothly even on bumpy roads. This bike will also serve as your cardiovascular exercise when used on a regular basis. Thanks to its hi-steel steel frame that can accommodate riders weighing up to 200 pounds, any of your family members can enjoy this three-wheeled bicycle anytime they want! The no-maintenance chainless design is ideal for beginners who are not yet familiar with maintaining a bike. 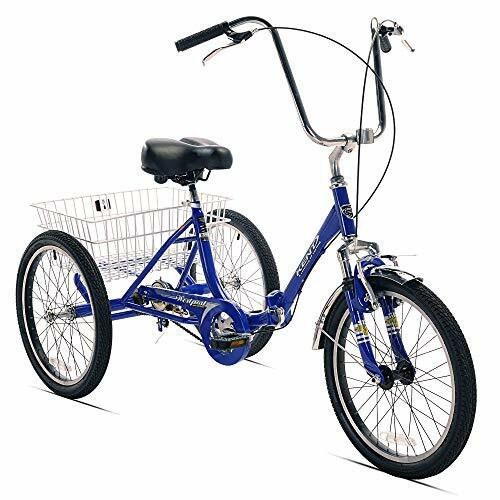 The Schwinn Meridian adult tricycle is simple yet elegant. 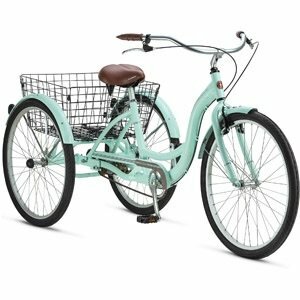 In its minty green color, you will surely turn the heads of your neighbor when riding this bike early in the morning. Thanks to its easy low standover/step-through aluminum, adults who have knee and joint problems can ride this bicycle. Moreover, its frame is made of steel and built to last. Rest assured that even when used regularly, with proper maintenance, this bike can continue for years to come. Its large wicker basket is ideal for hauling big loads. It has a comfortable padded spring cruiser saddle if you’re planning to use this in long distance biking. This bike is available in silver, green, blue, and red. 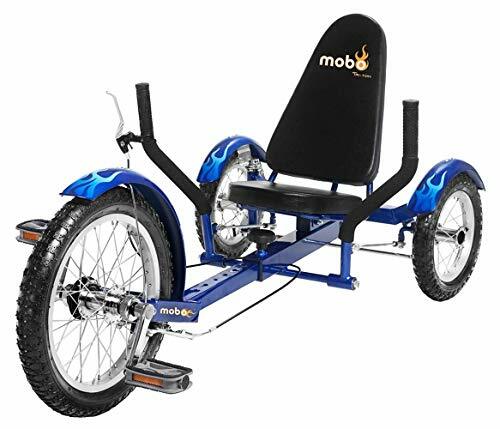 For our last item, allow us to introduce the Mobo Shift three-wheel recumbent bicycle trike. If you have extra budget, you might want to take a closer look at the world’s first reversible adult tricycle bike. Now you can enjoy the outdoor beauty without having to worry about your balance when biking. It is built and designed for cruising on paved and sloping terrains. The company prides themselves with its reverse gear. Now you can back it up in just a few seconds! Thanks to its low center of gravity, you don’t need to balance yourself when biking. Its dual-joystick steering will allow you to maneuver the bike smoothly. This is an ideal choice if you are still learning how to bike. It can accommodate riders weighing up to 250 pounds. Not to mention it ergonomic reclining-back seat allows you to six angle settings where you are most comfortable. The frame of the bike is made of hi-ten steel and requires little to no maintenance. Included in the package are the free-wheel hub, safety flag, and caliper brakes.